If you travel from Bangalore to Jog Falls, you would need to get on to NH 206 (National Highway 206 (India) - Wikipedia). National Highway 206 (NH 206) is a National Highway in India entirely within the state of Karnataka. NH 206 connects the towns of Tumkur and Honnavara and is 363 km lo ng. The distance between Bangalore and Jog Falls is some 400 kms, depending on where you start counting from. From Bangalore to NH206 is some 60kms. Which means most of your driving is on NH206. The highway, however, is two-laned throughout, except for a short stretch that is four-laned. The highway also is not in great shape, with several stretches that are less than stellar, and in urgent need of repair and resurfacing. Some stretches however are good enough to allow for 100kph driving, provided you keep your eyes peeled for distractions.Distractions? Yes, distractions. पलट तेरा ध्यान किधर है? The traffic signposts are also indicative. Like this one warning drivers of the presence of children nearby. What is noteworthy is the pace at which the schoolboy seems to be running. Which could mean that either children are by nature gregarious and therefore given to running across roads and that drivers should therefore watch out for running children, or that to safely cross roads a fair bit of athleticism is called for on the part of the children. Like I said earlier, the condition of the road is not too good. From Bangalore you get on to NH4. You could take the NICE Road to Neelamangala. You are then on NH4. There is work proceeding to convert this stretch into a traffic-signal free road. So there is a lot of construction all about. To widen the road, and construction of many flyovers. Once this work is completed, and it looks like it may be completed in 2010, driving through this section will become a lot quicker. And should cut down the drive time by half. Currently it can take upwards of half an hour to get to the toll section on NH4 - see the picture below. The interesting thing is that even though the NHAI (Wikipedia page) site lists the Tumkur-Neelmangala section as completed (link), it is most certainly not complete. Though there is a short section (the photo below) that is a tolled road, operated by "Jas Toll Roads". And, to complicate things further, if you see the map on the NHAI site, there is a short section between Tumkur and Neelmangala that is indeed listed as "Under Implementation". Driving on Indian roads can be hazardous to one's health. Need I say more? Even without the distractions. And the danger is not always in the form of oncoming traffic. It can present itself in the form of people with a non-functioning cranium. And in case you are wondering, there are two people who are traveling in this bizarre manner on the Tata Sumo. I can only imagine that this dude is trying to carry on a conversation with the passengers inside. Surely he is not attempting some exercises. This below, sir, is a harvester. You certainly do not want to get into an argument with this behemoth. Did you notice the size of the rotary jaws at the front of this monster? These two photos below are from a manned railway crossing. Coconut vendors make a killing on this crossing - because the crossing remains closed for 10-15 minutes when a train is scheduled to pass. The weather is hot. And a coconut is a good, a very good choice. Thus far, this is the only section on all of NH206 that is four-laned. And before you get all excited, it is all of some 3-4 kms long. After Shimoga, the scenery takes a turn for the green, as you enter the outer fringes of the Western Ghats. Spotted at a Crossword Bookstore in Bangalore bookstore. 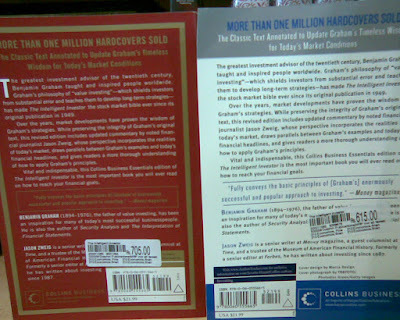 The two are the same title, and if you observe closely, even have the same ISBN - 9780060555665! Yet, and this is where things get a bit comical, the book on the left has a price of Rs 705, while the one on the right is listed at Rs 615. Secondly, the blue cover book is graced with a "Crossword Recommends" sticker, while the red book, one on the left, has to make do without one. 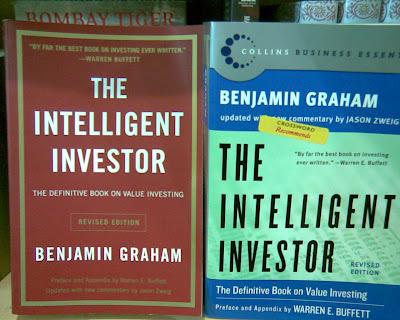 Thirdly, that it should happen to a book about intelligence and investing, The Intelligent Investor: The Definitive Book on Value Investing. A Book of Practical Counsel (Revised Edition) , makes it that much more, ironical, shall we put it? I had blogged about Law of one price breaks down a while back. This case is even curioser. Or as I may put it, "ajab books ki gazab price". Thomas Friedman's latest book, Hot, Flat, and Crowded 2.0: Why We Need a Green Revolution--and How It Can Renew America , is now out in paperback. In his New York Times posting, Excerpt - Hot, Flat and Crowded - First Chapter - NYTimes.com, he includes a link to the first two chapters of the paperback - Excerpt - Hot, Flat and Crowded - First Chapter - NYTimes.com - in PDF form, and 48 pages long. The Strand Book Stall Annual Sale is being held this year at Basava Bhavan. This is change from their usual venur at the KSCA's Chinnaswamy Cricket Stadium, where it has been held since 2005. The reason given is the work happening on the Bangalore Metro. There is a fairly good and large selection of books, though compared to previous years, it seemed a bit less. I don't know, since I don't know the number of books this year and in previous years. I bought eight books - five for the kids and two for me. And oh yes, one dictionary. My last post on Yercaud, Yercaud - The Drive, was about the drive to and from Yercaud. This one is about things you could do while at Yercaud. Some 5-6 kms from Yercaud Lake is the highest point in Yercaud, Servaroyan Hill, which is known for the Servaroyan Temple, inside a narrow and low cave. The view from the Servaroyan Hill is, expectedly, beautiful, mostly. It is marred slightly by the presence of some barren hills. Why? The discovery of bauxite and the mining operations around the Shevaroy hills have ensured that forest cover has been depleted in areas - as you can see from the photo below. Pity. This is on the way down from the Shevaroy Hill. Just before you take the right fork to go up the Shevaroy Hill, there is the Raj Rajeshwari (form of Goddess Parvati) temple on the left. Takes 15 minutes to visit, but worth going. This is the view from Pagoda Point. Why it is called the 'Pagoda Point' I don't know. But the house below makes for a picture perfect setting. If one were the patient type, and willing to invest a few hours, you could wait for the light to get just right, and then shoot some snaps. Would likely come out fabulous. The Sun made for some haze in the air, as you can see, especially when shooting near the end of the zoom lens' range. From the Gent's seat (and no, I am not talking about lavatories), you get a beautiful view of the GRT Nature Trail hotel. As you can see, if you stay in one of the rooms facing the valley, you are likely to catch spectacular photos of the sunset and also of Salem at night. Move the camera just a wee bit to the right, and I could see this woman perched quite precariously on top of an almost dead tree, axe in one hand, grabbing on to the tree with the other, and swinging away more merrily than Sehwag at Saqlain Mushtaq. A nest on a leaf, in the Rose Garden.